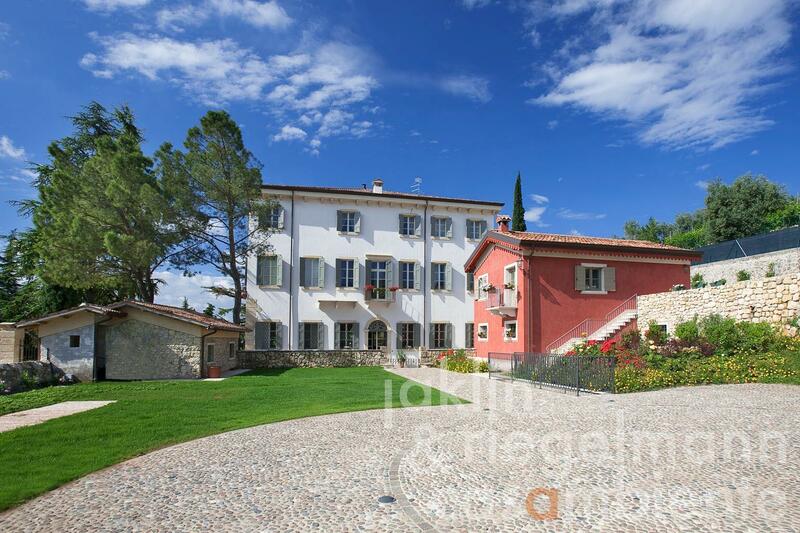 This noble estate for sale is located in the heart of the Valpolicella region close to Verona and Lake Garda in Italy. The property comprises a large stately villa (about 1,600 m²) on south, a spacious country house (about 750 m²) on west, a guest house (about 195 m²) on northeast as well as a tool shed (about 40 m²) and a large underground garage (about 550 m²) with nine parking spaces. The buildings are surrounded by about 6,600 m² well-tended park with a mature tree population and a representative forecourt. A salt water swimming pool (15 x 7.5 m) with sun terrace completes this luxurious property. The view from the property goes east across the town and across the valley on south and southwest. The property is protected by a gentle hill with vineyards on west and north. The entire property has been meticulous restored a few years ago while preserving historical details in the process. A beautiful staircase with a glazed elevator connects the four residential floors and the basement of the villa. The villa features four apartments with about 400 m² each, with two spacious apartments on the ground and first floors as well as two apartments of equal size on the second and third floors. The ground floor offers a large living area, which opens onto a loggia on south, a cozy living room, dining room with access to the garden on east, bedroom with en-suite bathroom, reading room/studio with bathroom and a second bedroom with en-suite bathroom. The first floor consists of a large living area over the entire depth of the villa, from which a large kitchen, two bedrooms with two en-suite bathrooms and walk-in closet as well as a separate guest area with bathroom can be accessed. The second floor is divided into two separate apartments, which offer a large living area, bedroom with en-suite bathroom, kitchen and a bathroom each. Two stairs from the living areas lead to the attics, which is divided into an additional living area, bedroom, two bathrooms and a walk-in closet each. The basement of the villa features two wine cellars, laundry, bathroom and a passage to the underground garage with nine parking spaces. A second access for pedestrians leads to the forecourt of the property. The country house on west is divided into two parts and offers on the ground floor of the first unit an entrance hall with bathroom, which leads to a living area with a reading room, kitchen and a dining room. On the first floor there are two bedrooms with two en-suite bathrooms and a walk-in closet. A third bedroom with en-suite bathroom and a laundry are located on the second floor. The third floor consists of a studio, which can also be used as a fourth bedroom. The second unit offers a limonaia and lounges on the ground floor. The first floor provides additional living room or office space. The guest house on north offers a large living and dining area with kitchen and a private terrace behind the house and, on the ground floor, three bedrooms, two bathrooms and a laundry. The property for sale is ideally used as a representative residence but can also be rented in part if desired. The conversion to a high level relais/spa is possible. The underground garage could be converted into wellness facilities. Italy, region Venetia, province Verona. Electricity, mains water, central heating, fireplace, gas connection, telephone, broadband internet access, automatic gate, elevator, alarm system, irrigation system, swimming pool, balcony, garage, private parking, terrace, garden.